Although this was just about 2 years ago it was beginning to dawn on us that people going through this may need some reassurance and a first hand account. The biggest evidence of this being the thyroid photos on Flickr being the most popular. This either tells us that we are not good at taking photos or thyroid issues are common! Having struggled with high heart rates (120 resting on the sofa) weight loss, hearing my heart loud at night in my ears and hot all the time combined with a scary heart sensation on a mountain bike ride I decided to get it checked out by the doctor. One day after the blood test I was put on medication due to a thyroid level 5 times higher than it should have been. I was diagnosed with hyperthyroidism at the end of 2003 and was started on beta blockers and carbimazole. I endured 1 month on beta blockers (at least they didn't slow me down too much!) and 18 months on carbimazole and a blood test every month. I was then thankful to get off the meds. It took 6 months before all the symptoms returned and I started to lose weight again. I returned to the doctors and was put on carbimazole again. Feeling disappointed about the relapse and the fact that I had not felt well for the past 2 years I endured another couple of months before being referred to an endocrinologist. I was annoyed that I had not been referred earlier but this was the doctors decision to look after it themselves. In hind sight it was the right decision as I could develop a relationship with the doctor that I later relied upon. The endocrinologist was very clear that I had 'graves disease' and there was 2 options. The first radioactive iodine the second surgery. I opted for the third, wait for it to go away! This I was told was not an option after the relapse. I was not keen on radioactive iodine due to it possibly not working the first time around and the fact that I would be responsible for taking it and looking after myself, staying away from others was also not a pleasant thought. On the other hand thinking of having a cut across the throat and what was deemed as a major operation was also not that attractive to me! So I decided to meet with the surgeon who told me that I would be in 2 days and back to work within the week! This sounded not so bad and so I opted for the surgery. I thought that it would be 3 months at least but a cancellation meant that I was in within the month! I arrived in the hospital in the afternoon and saw numerous doctors and had a few blood tests. Information was not the clearest and what the surgeon had told me was completly contradicted as I was told it would be at least 5 days in hospital. Neverthless I slept quite well that night and in the morning I was taken for a voice check. This was one of the funiest things I have had to do. A tip, do not take your partner in as they will continue to make fun forever! It was then a meeting with the person who puts you to sleep. It was all quite surreal! I remember being quite scared waiting to go in. I was lucky to have a lady on my ward Carol who was so reassuring. She was in after me and we got each other through it! My partner was also a rock never showing how scared they were inside which helped as I would not have needed much to make a run for it at this point! So it was down to the putting to sleep room and the doctors and nurses were fantastic! They totally tricked me and the next thing I knew I was coming around in recovery. I felt no pain but later felt the embarrassment of telling the same story over and over coming around with my family on the ward! I had a drain in my neck which I carried around in my pocket and eating was a nightmare for the first 2 days. Although I was struggling to swallow and choked on my food regularly I didn't once feel panicked! I was put on calcium tablets and levothyroxine straight away. My voice was very weak for about a month after. Being a teacher this worried me but it came back with time. This was 4 days after the op. 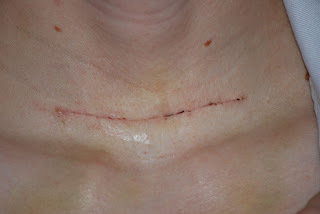 The stitch came out 1 week after the operation. My drain was taken out after 1 day. This was not as bad as you might think. You can see on the left of the picture where the drain was. I was visited by the surgeon on 2 occasions. There was 2 questions I wanted to know, when could I go home and how much thyroid gland was taken. He would not say when I could go home but he informed me that they had removed most of the gland but not all of it as it wasn't safe enough. I spent 5 days in hospital and then couldn't stick it anymore! The staff at the hospital were brilliant but it is always better recovering in your own home! At home I was looked after as I was quite weak and slept for the next 3 days! I was very scared the first night and I was thankful that I was in contact with a friend of the family who was a thyroid surgeon and only too happy to put my mind at rest. My biggest issue was the lack of calcium and its side effects but it was also due to me feeling very vulnerable! 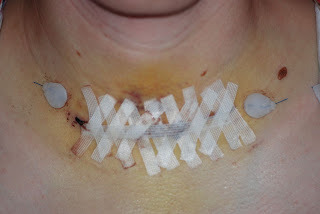 I returned to the hospital and my stitch was removed, again not as bad as I thought! I began to feel much stronger after a week and a half after the operation. I visited the surgeon for a last appointment and I was dismissed unless my voice did not come back within two weeks. Unfortunatley my voice did not come back and so I returned again for another appointment. 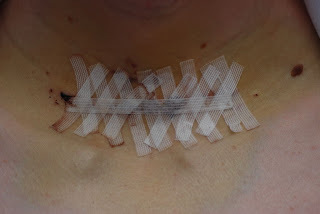 I was asked to come back in another 2 weeks if it did not return as the surgeon was convinced that it was temporary damage to the laryngeal nerve. He was right it returned and got stronger. I was not back as a teacher fully until the following September. I missed 2 months of teaching but went in part time to conserve my own sanity! 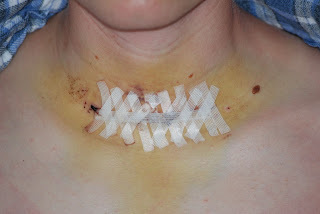 About 1 1/2 weeks after the operation. Regular contact with the doctor allowed me to get my medication sorted very quickly. I am on 125mcg of levothyroxine having started on 150mcg. Within 1 month I was back on my bike and within 3 months I rode the route de grande alps. It has taken a good 2 years to get back to feeling normal! A feeling that I had previously forgotten! My medication has been consistent since the operation. Blood tests have shown some kind of stability but I think any thyroid patient can tell when they are high or low! I have since developed mild circulation problems in my feet and hands and have been given nifedipine to take as and when. From my perspective this was the best thing that could have happened as I did not realise how unwell the hyperthyroidism was making me! I feel so much better now. The scar from the operation is how my partner cheekily calls it a 'bramble scratch'! You can hardly see it! If I was to sum up my experience I would say that it was not half as bad as I thought it would be! I wouldn't have got through the procedure without the support of my family and friends. If you have any quesitons or just want to make contact feel free to communicate through the blog!